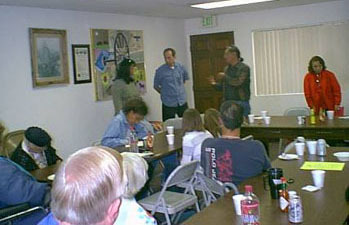 Tonkawa secretary, Roy Cook was very late but Jerry Starnes got there early to set up the room for the noon TONKAWA meeting, April 9, 2006. TONKAWA President Esther Abrahano opened the meeting with a blessing and chaired the meeting. The TONKAWA Treasurer Vicky Gambala was missing also but her efforts to promote attendance was noted and appreciated. We are very pleased to enjoy a fine attendance of community members. Our speaker is an old friend to the San Diego Health community, Tom Ledot, Tlingit. He is working with the San Diego State Gerontology program. They have a National Institutes of Health government grant to do, yes- another survey, this time of the issues and needs, of care providers of Native American Elders. Dr. Mario Garrett leads this project. Mario brought his two daughters: Tabitha and Hannah. 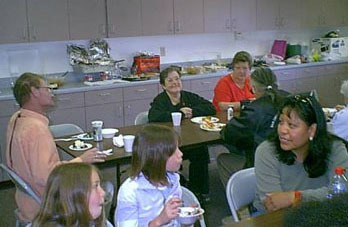 Also in attendance is project worker Marie Begay, Dine. Don Vigneault called out for the distribution of the hospitality gifts as we cleaned up. Good conversations continued as we locked up the meeting room. Traditional tribal teasing and good fellowship are some of the qualities that make this one of the most satisfying meetings of the month. Maybe we will see you and a friend (We are always recruiting Elders to be TONKWA members!) 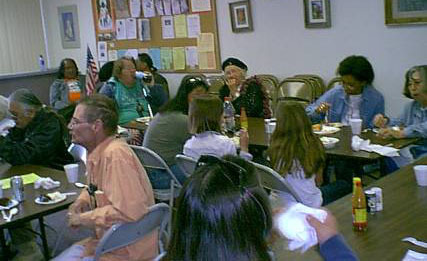 at our next TONKAWA meeting, noon June 11, 2006, at the Many Nations: Chet Hunt Community room, 3928 Illinois St. San Diego, CA. 92104.